Very busy but excellent service, lots of familiar faces in here today. I still think back to the 1970s when this pub was very different to what it is now. Very late on a Monday evening and the last pub on an annual tour of Wandsworth. I did not note all the beers that were available, but had to rush for the last train home. The final port of call before catching a train from the railway station opposite the pub. Afternoon visit and fairly busy. Wimbledon - SW19 Summer Ale 4.00 Straw coloured citrusy beer. Final pub on a short tour of Wandsworth. A busy Tuesday afternoon. We enjoyed a pint and a sandwich before catching one of the frequent trains from the station across the road. Sambrook's - Wandle 3.80 One of the best pints of Wandle that I have had for a long time. This seems to be regularly available in this pub. 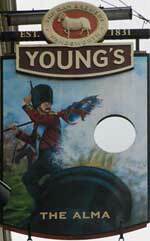 The pub is found in Wandsworth, Greater London, SW18 1TF. 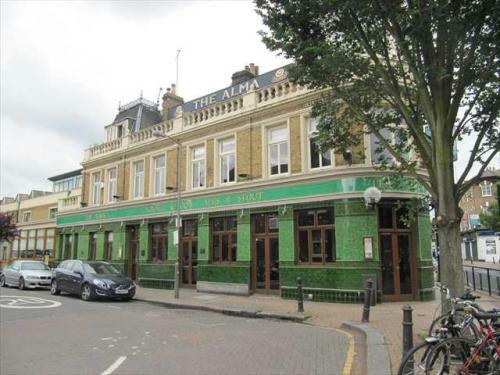 Situated on a corner directly opposite Wandsworth Town railway station, this pub has a beautifully tiled exterior, and a second floor dome. The interior boasts an island bar, and there is a function room available for hire. We have visited this pub 6 times, seen 11 different beers and tried 5 of them.